At the end of May, OSU is hosting a festival of theater and workshops centered on gender and sexuality. Two theatrical pieces will be performed in repertory during the festival. The Gender Project is a new piece using classical work. The other show is The Normal Heart, a staple in the gay literary canon. 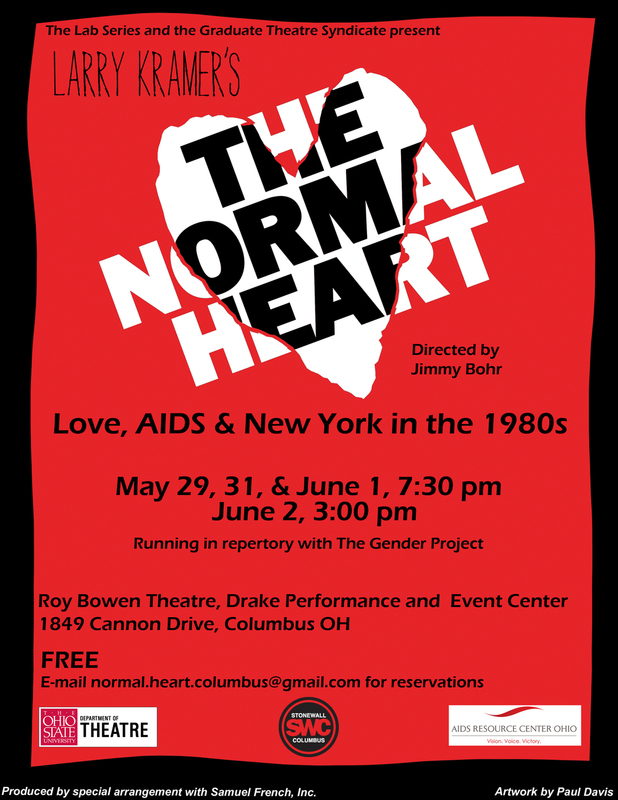 Larry Kramer’s scintillating play helped spark the outrage over the lack of concern for the HIV/AIDS crisis in the 80s. This performance aims to explore how it continues to be relevant to young gay men. Being Ned in The Normal Heart has been a long-term goal for Brent Ries. Shortly after its world premiere, CATCO produced the Columbus premiere in 1986. Back then, CATCO was using the same stage as OSU is now. Brent saw the Columbus premiere twenty-seven years ago. Later, he would act in The Normal Heart out in LA. With this production, he gets to fulfill his dream of playing the lead. Every actor has a few passion projects that they dream of working on. The message of this show is important to Brent, and is something he’d like to bring to younger theater-goers. Brent is hoping that young people will walk away with new insight and concern for our continuing HIV/AIDS crisis. Current OSU freshmen were, mostly, born in the 90s. For many, the crisis a decade before they were born may be something that they’ve never even thought about. Each of the shows will run workshops throughout the festival. These aim to educate and inform, to tell the story of our past. Jane Elliott is directing the other show in repertory, The Gender Project, a piece that explores the gender spectrum of some of Shakespeare’s most iconic male characters. Her conceived piece runs alternate evenings with The Normal Heart. In it, her four leading ladies play Shakespeare’s men as male and female, exploring how the change in gender affects their stories. How does re-gendering shape how we view some of literature’s most famous men? The piece will also be framed with new work devised by the ensemble and a half hour “on your feet” post-show debriefing. The theater double feature is coming up at the end of May. It’s part of the Theater Department’s New Works Lab, whose aim is to foster experimental and non-traditional theater work. The department sets aside a flexible, equipped space for periodic student work. Ultimately, this space is meant to replicate a venue that’s standard fare in New York. Minimal lighting, flexible seating, and not much in the way of set. OSU’s Bowen Theatre is not unlike the Public Theater where Kramer’s play premiered almost thirty years ago. The two shows run May 28 through June 2 at OSU’s Bowen Theatre. Admission is free for the entire festival. When it comes to visual spectacle, a production on the level of War Horsemight come along only once in a decade. Though the show, based on a 1982 children’s book by Michael Morpurgo, is a stage musical, it comes off more like a movie – so much so that, four years after it was adapted for the stage in 2007, Steven Spielberg adapted it into an Academy Award-nominated film. The play, written by Nick Stafford and originally produced by the National Theatre in London, puts something on the stage that makes the production feel cinematic. The magic ingredient is not difficult to identify: It’s Joey, the 8-foot tall horse who is, ostensibly, the main character.